Life expectancy was probably the same for early modern and late archaic humans and did not factor in the extinction of Neanderthals, suggests a new study by a Washington University in St. Louis anthropologist. Erik Trinkaus, PhD, Professor of Anthropology in Arts & Sciences, examined the fossil record to assess adult mortality for both groups, which co-existed in different regions for roughly 150,000 years. Trinkaus found that the proportions of 20 to 40-year-old adults versus adults older than 40, were about the same for early modern humans and Neandertals. This similar age distribution, says Trinkaus, reflects similar patterns of adult mortality and treatment of the elderly in the context of highly mobile hunting-and-gathering human populations. Establishment, was published the week of Jan. 10, 2011 in the Proceedings of the National Academy of Sciences. Older individuals are rarely found among the remains of late archaic humans, which has prompted some researchers to propose that Neandertals had an inherently shorter life expectancy, contributing to their demise. However, if early modern humans did have a demographic advantage, Trinkaus argues, it was more likely due to high fertility rates and lower infant mortality. “If indeed there was a demographic advantage for early modern humans, at least during transitional phases of Late Pleistocene human evolution, it must have been the result of increased fertility and/or reduced immature mortality,” writes Trinkaus in the paper’s conclusion. “Neither adult longevity nor proposed modest shifts in developmental rates are likely to have played a role in this demographic transition. Melt off from small mountain glaciers and ice caps will contribute about 12 centimetres to world sea-level increases by 2100, according to UBC research published in Nature Geoscience. The largest contributors to projected global sea-level increases are glaciers in Arctic Canada, Alaska and landmass bound glaciers in the Antarctic. Glaciers in the European Alps, New Zealand, the Caucasus, Western Canada and the Western United Sates--though small absolute contributors to global sea-level increases--are projected to lose more than 50 per cent of their current ice volume. The study modelled volume loss and melt off from 120,000 mountain glaciers and ice caps, and is one of the first to provide detailed projections by region. 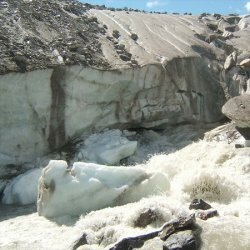 Currently, melt from smaller mountain glaciers and ice caps is responsible for a disproportionally large portion of sea level increases, even though they contain less than one per cent of all water on Earth bound in glacier ice. Radic and colleague Regine Hock at the University of Alaska, Fairbanks, modelled future glacier melt based on temperature and precipitation projections from 10 global climate models used by the Intergovernmental Panel on Climate Change. Global projections of sea level rises from mountain glacier and ice cap melt from the IPCC range between seven and 17 centimetres by the end of 2100. Radic’s projections are only slightly higher, in the range of seven to 18 centimetres. Radic’s projections don’t include glacier calving--the production of icebergs. Calving of tide-water glaciers may account for 30 per cent to 40 per cent of their total mass loss. 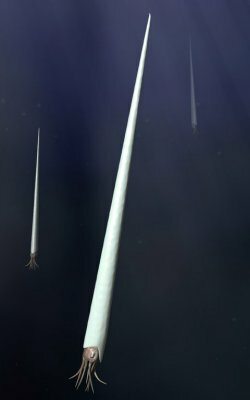 Powerful synchrotron scans of Baculites fossils found on American Museum of Natural History expeditions to the Great Plains suggests that the extinct group of marine invertebrates to which they belong, the ammonites, had jaws and teeth adapted for eating small prey floating in the water. One ammonite also provided direct evidence of a planktonic diet because it died with its last meal in its mouth—tiny larval snails and crustacean bits. The detailed description of internal structure of ammonites, published by a Franco-American research team this week in Science, also provides new insights into why ammonites became extinct 65.5 million years ago when an asteroid impact led to the demise of the world's nonavian dinosaurs and much of the plankton. "I was astonished when I saw the teeth for the first time, and when I found the tiny plankton in the mouth," says first author Isabelle Kruta of the Département Histoire de la Terre, Muséum National d'Histoire Naturelle in Paris, France. Kruta began the project as an Annette Kade fellow at the American Museum of Natural History. "For the first time we could observe these delicate, exceptionally well-preserved structures and obtain information on the ecology of these enigmatic animals." "When you take into consideration the large lower jaws of ammonites in combination with this new information about their teeth, you realize that these animals must have been feeding in a different way from modern carrion-eating Nautilus," says Neil Landman, curator in the Division of Paleontology at the American Museum of Natural History. "Ammonites have a surprisingly large lower jaw with slender teeth, but the effect is opposite to that of the wolf threatening to eat Little Red Riding Hood. Here, the bigger mouth facilitates feeding on smaller prey." Ammonites are extinct relatives of the squid and octopus; the Nautilus is similar in appearance to many ammonites but is a more distant relative. Ammonites appeared about 400 million years ago (the Early Devonian) and experienced an explosive radiation in the early Jurassic. In fact, ammonites became such an abundant and diverse part of the marine fauna that they are, for paleontologists, classic "index" fossils used to determine the relative ages of rocks. Until recently, the role of ammonites in the marine food web was unknown, although some previous research by Landman and colleagues on the shape of the jaw, as well as a 1992 paper by Russian scientists that reconstructed some of the internal structures by slicing fossils, provided clues. The current study used synchrotron X-ray microtomography to digitally reconstruct the mouths of three fossils found in South Dakota. The three dimensional reconstructions are so high in quality that the jaws and teeth are revealed in their complete form. "X-ray synchrotron microtomography is currently the most sensitive technique for non-destructive investigation of the internal structure of fossils," says Paul Tafforeau of the European Synchrotron Radiation Facility. "For this study, we tested specimens after an initial fossil preparation and scanning on more conventional machines by Kruta failed to provide enough detail. The synchrotron results were so impressive that we scanned all available samples, discovering nearly each time radula, and, for one of them, plankton." "The plankton in the Baculites jaws is the first direct evidence of the trophic habits of the uncoiled ammonites and helps us understand the evolutionary success of these ammonites in the Cretaceous," says Fabrizio Cecca of the Laboratoire de Paléontologie, Université Pierre et Marie Curie in Paris. Ammonite jaws lie just inside the body chamber. The research team's new scans of Baculites, a straight ammonite found worldwide, confirms older research that ammonites had multiple cusps on their radula, a kind of tongue covered by teeth that is typical of mollusks. The radula can now be seen in exquisite detail: the tallest cusp is 2 mm high, tooth shape varies from saber to comb-like, and teeth are very slender. The jaw is typical of the group of ammonites (the aptychophorans) to which Baculites, belongs. In addition, one specimen has a tiny snail and three tiny crustaceans in its mouth; one of the crustaceans is even cut in two pieces. Because these planktonic fossils are not found anywhere else on the specimen, the team thinks that the specimen died while eating its last meal rather than being scavenged by these organisms after death. "Our research suggests several things. First, the radiation of aptychophoran ammonites might be associated with the radiation of plankton during the Early Jurassic," says Landman. "In addition, plankton were severely hit at the Cretaceous-Tertiary boundary, and the loss of their food source probably contributed to the extinction of ammonites. This research also has implications for understanding carbon cycling during this time." Isabelle Rouget, Laboratoire de Paléontologie, Université Pierre et Marie Curie in Paris, agrees, adding that "we now realize that ammonites occupied a different niche in the trophic web than we previously thought."